In my next life I’ll be better at planning my lessons ahead of time (also at blogging regularly). I’ve found that in my teaching life I think on my feet way better than I think in advance. Today was a perfect example! I was planning on having my French 2 year long class rewrite a present tense story using the imperfect tense (imparfait). Then we’d put the new verbs on the board and talk about what was happening in the story. I was also planning on introducing how/when to use imparfait in a new way & show some videos from my previous classes. HOWEVER, as my students were working on their bellwork, I realized how long it was taking them and how difficult it was proving to be for them. On the spot I made a google form (while they were finishing). I had students grab their Chromebooks. First I needed them to download a new Chrome extension that my ITS found. It’s genius for math or world language teachers! (I took this picture after I wrote the directions for my block classes – I do this often…write something on the whiteboard, snap a picture with my iPod touch and use it later or share it with students!). After all the students submitted their answers, I downloaded the Flubaroo script, ran it and graded the assignment (see website for tutorial & video…super easy!). I opted to have Flubaroo send the students their grades. Tonight’s homework is to use their responses & and their grade to correct their answers. Obviously I don’t want students to see who submitted the responses. So I have hidden the columns with student info (right click on column heading, select ‘hide column’). I also hid the Flubaroo spreadsheet. I didn’t want to delete this information because I still need it! Tomorrow I want students to quickly be able to see which answers are completely correct, which ones would have received partial credit (had this been a formal assessment) and which ones were completely wrong. In order to do this, I used conditional formatting to identify the correct answers in pink. I did have to go through by hand and change the almost correct answers to blue. Anything in black is wrong. Depressing huh? It wasn’t until today that I realized the power of having students use google forms to submit responses and then share the spreadsheet with them so that they could see others’ responses and we could talk about them. I’m excited for the possibilities! Great stuff! Can I suggest that you use a blog to supply your lesson plan/assignments to your students? Then you won’t have to send an email, just post on your Blog, the student clicks on the link or you can embed the form there, along with any other links or embeddable items. 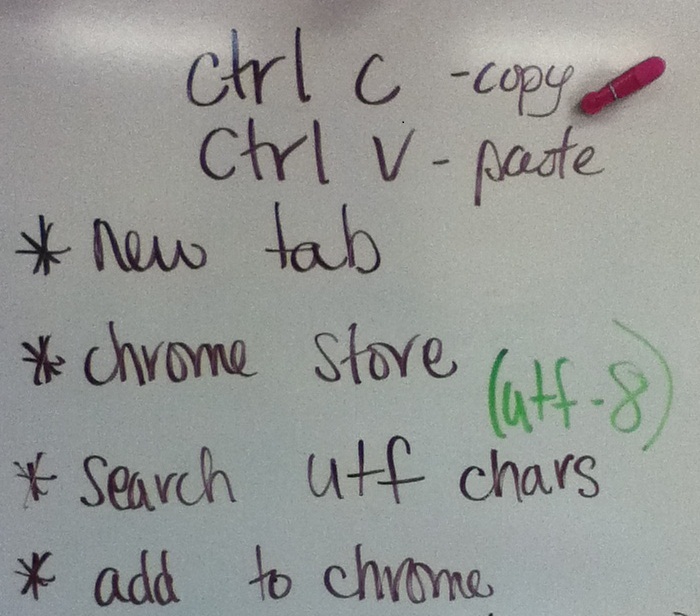 Our teachers are have awesome success with this format using Chromebooks in a 1:1 situation.